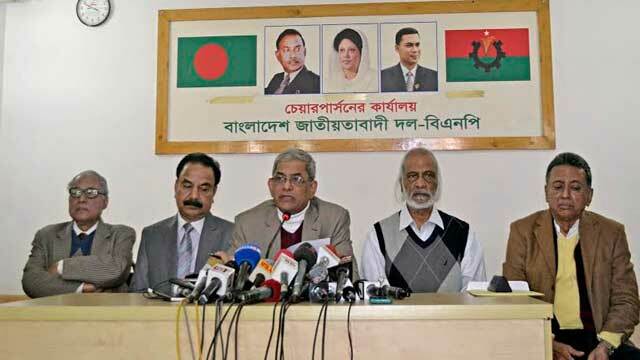 Dhaka, Jan 13 (Just News): BNP Secretary General Mirza Fakhrul Islam Alamgir today trashed Prime Minister Sheikh Hasina's plan on the election-time government saying that it would deepen the prevailing political crisis further. "There is no clear provision in the constitution about the election-time government. The election will not be free and fair if it’s held under a partisan government keeping the parliament undissolved as per the constitution," Fakhrul said. Fakhrul came up with his party's formal reaction to the yesterday’s speech of Prime Minister Sheikh Hasina on the election-time government. The BNP leader was addressing a press conference at BNP Chief Begum Khaleda Zia's Gulshan office in Dhaka this afternoon. Prime Minister Sheikh Hasina in her address to the nation yesterday said that the next parliamentary election will be held under an election-time government as per the constitution. There is no clear provision in the constitution that the election-time government will serve only the routine work, Fakhrul said. The prime minister should take an initiative for holding dialogue with all stakeholders if she (Hasina) sincerely thinks any new thing about the election time-government, Fakhrul said.